Many of you readers agreed it was great advice in my last post about visiting Venice: Forget the map and get lost in those winding, labyrinthine streets, go up and down the foot bridges and endless stairs, and find yourself navigating passageways that will inevitably lead to… a gelateria! 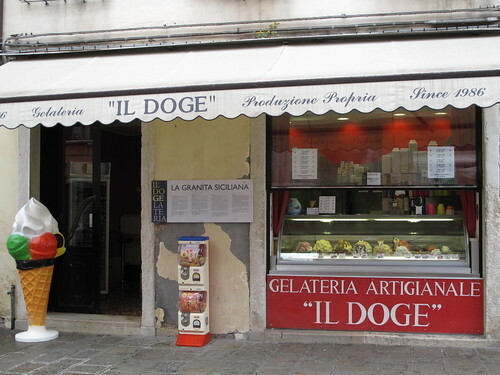 I can’t even guess the number of gelaterias there are in Venice. You’re not likely to see a street without one. And boy do I love those streets with half a dozen! I arrived in Venice ready to do a throw down of the best gelato shops in the city. I had my list of addresses starred on my map (yes the same map that would end up staying in my pocket all day long). I headed straight for La Boutique del Gelato near Campo Santa Maria Formosa (the tiramisu was subtle, not too strong and the stracciatella was like chocolate chips floating in clouds). I then made my way to Il Doge by the Campo Santa Margherita (where the mint was bright green and refreshing). I made sure I had the address for Alaska in Sante Croce, to try the less traditional flavors like avocado, artichoke and fig. And I had the addresses for Clausin, Nico and Paolin too. But you really don’t need to. And I quickly realized I was going to simply go where my feet took me, and try the gelato there! 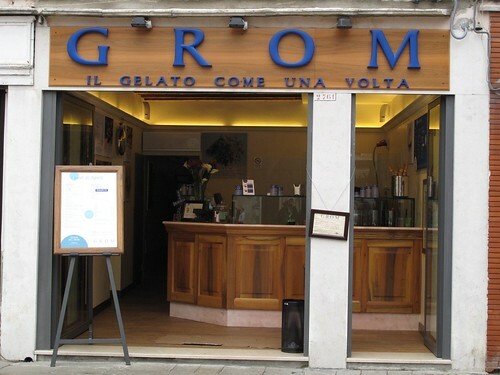 I even stumbled upon Grom doing that, which has shops all over Italy and is now quite popular in New York City and Paris too. 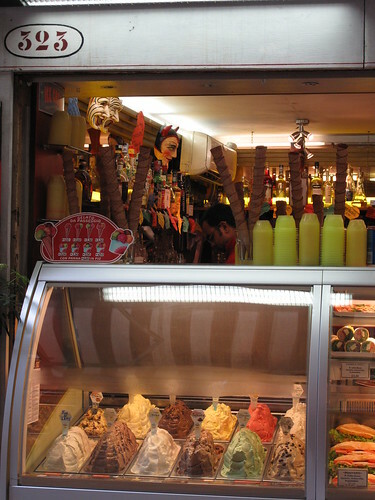 Glance in any shop with its piles of creamy gelato shaped like mountains in their metal bins, with that artistic swirl the Italians behind the counter give it. The colors and flavors practically jump out at you. 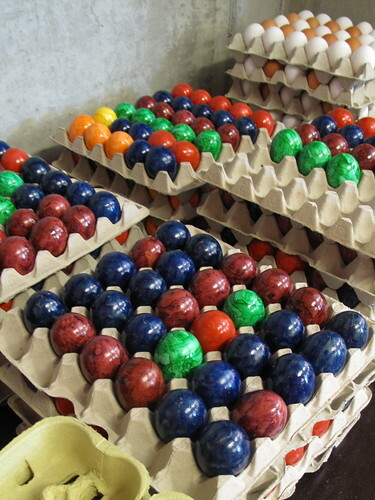 There’s usually a bit of the main ingredient on top of each flavor, so you know just what it is. At this point, you can practically taste it. 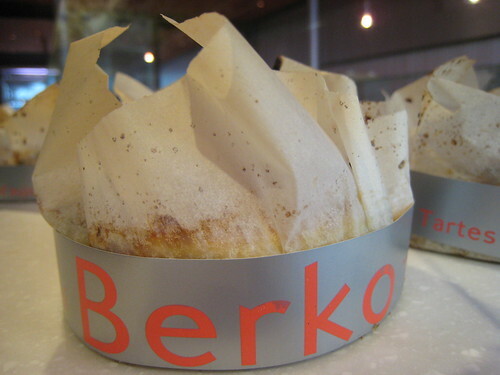 So ask for a cono or a coppa (the former being the more popular), and know that you can’t go wrong. Especially if you spot the Italian word, artigianale (artisanal). That way you know it’s being made on premises with fresh ingredients, rather than from a frozen mix. 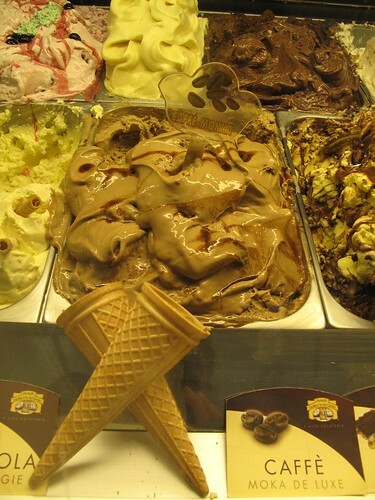 And hey, it’s only one Euro (give or take) for a scoop, so you can always try again… and again ! 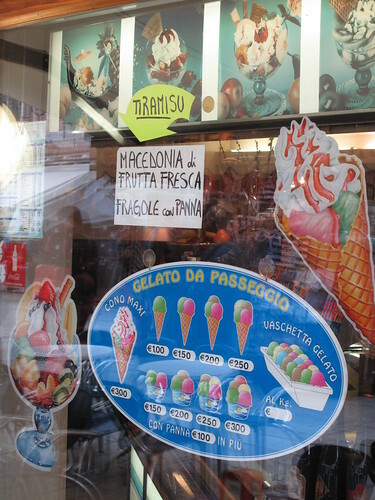 When in Venice the rule is ….gelato for breakfast, lunch and dinner and all in between. The gelato photos just scream for ice cream….the only problem is that I always order the same flavors….The next time I do hit Venice I am going to be more creative but fig? 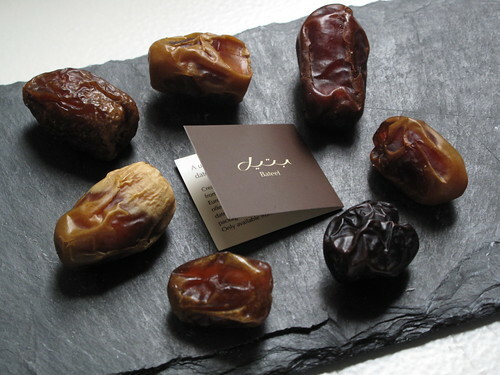 Love it….want some now………………..
Romy, all of the above addresses are worth noting down! 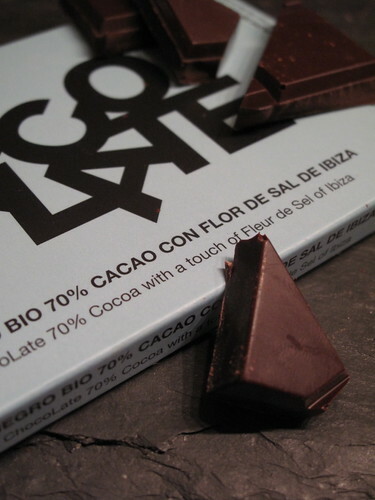 And hey, while you’re tasting those crazy flavors, your hubby will have no problem finding cioccolato, pistacchio, nocciola, or real plain and simple: fior di latte. Lani, I am so with you – gelato all day long! So you always order the same flavors — which ones? I’m a big fan of coffee, so it’s hard for me to stray from that. But I managed ok this time and tried lots of others !! Good morning to me (It’s 9 am here in Toronto). I think I need a cup of gelato. 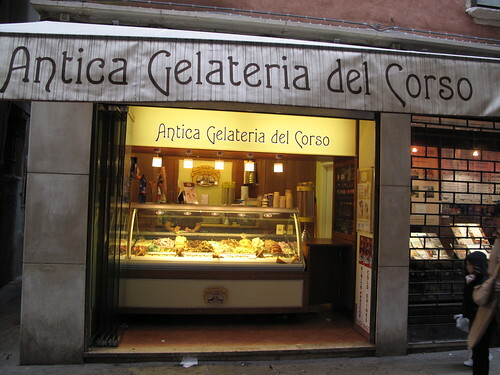 Since I work so close to Little Italy, I just might go for a coppo at a local geletaria here. You’re killing me! It’s hot and humid in the City, and i start my day with gelato…gelato…gelato. Actually, i’m feeling better already. Grazie mille (or mille grazie – not sure). And you’ve inspired me to try new flavors. I’m like Lani, always ordering the same few. 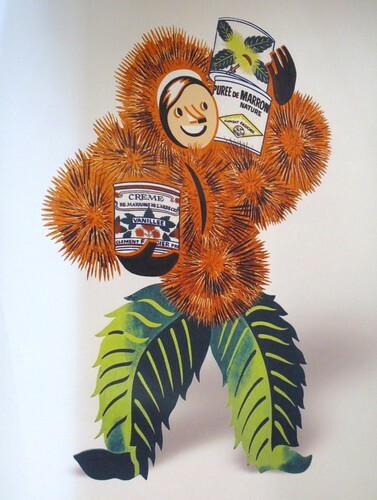 But I’m also like Romy’s hubby – not too sure about the fig and artichoke. Your pictures are awsome, as usual. Where are we going next? I can’t wait. This may be my favorite post so far. I especially love the photos – makes me feel like I’m right there with you! 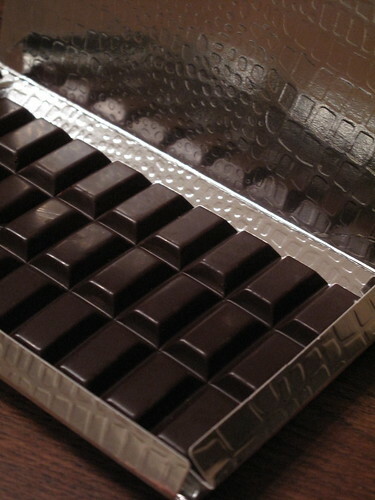 PS – Grom’s Extranoir chocolate flavor is heavenly! My favorite choice of gelato is STRACCIATELLA. Just love the creaminess of the gelato with the crunchiness of the chips. Sometimes if I am really ready to be bad I order some sort of cappucino with it. I am then really cheating but love every single spoonful. 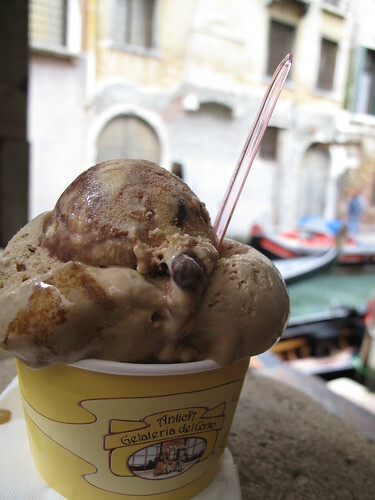 OMG OMG OMG… two of my favorite things – Venice and gelato. Looks heavenly. I love the photos. 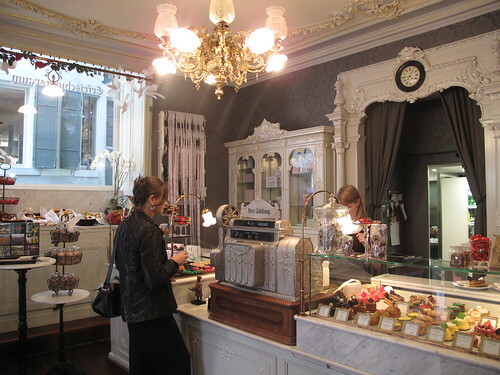 I wish there was more gelato in Zürich. Can you do a write up on that if you find some cool places? 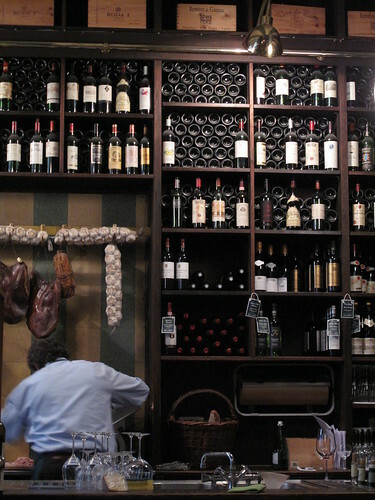 perhaps next visit to La Serenissima… in the meantime, we finally have a couple of good places here! 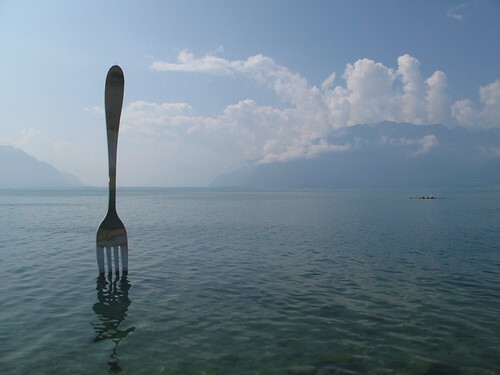 Hm… nearly lunchtime… gotta go…. Definitely should have asked you about food before I went to Venice. I love you pictures, PS. Also, I’m making grill cheese for dinner tomorrow. I’ll have to let you know how it goes. 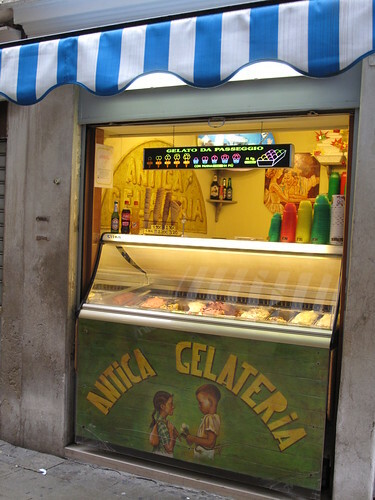 Probably the most famous gelataria in Venice (among both foreigners and locals) is “Da Nico” on the southern Zattere waterfront facing the Guidecca island across the wide Giudecca canal. Nice views, great place to catch some sun on a beautiful day! 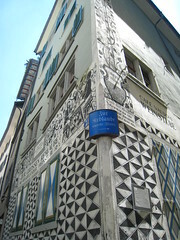 It’s located around the corner from the last gondola boatyard in Venice and near the church of the Gesuati. Its signature dish would probably be the “Gianduiotto da passaggio”, which is a brick of frozen gianduiotto (a bit like the bacio flavor… chocolate and hazelnut) gelato in a paper cup filled to the brim with handmade whipped cream that you can snack on while you stroll! This post brought back so many amazing memories of all the buckets of Italian gelato I ate last year. 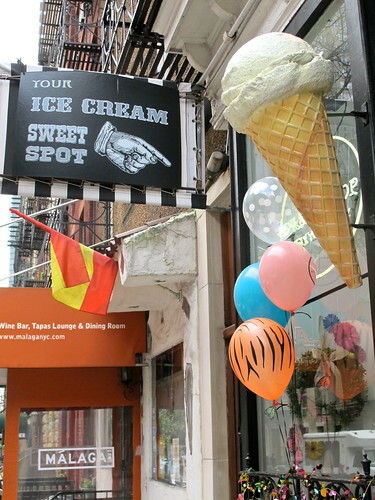 I second the poster above who recommends Da Nico and their mind-blowing slab of chocolate gelato with whipped cream. (No joke, I was so distracted by it that I fell flat on my face on the Ponte dell’Accademia with it in my hand. Bruised my knees. Rescued most of the ice cream.) Actually, Da Nico is in my favorite part of Venice–in the south part of the city where the Grand Canal gets really wide and blue. I love strolling along there, where the sidewalk literally comes right to the edge of the water. Loved this! Thank you so much for sharing. Hey – did you really try the artichoke flavor? In Nice I tried avocado and olive, which were both surprisingly sweet. The only one that didn’t I didn’t care for was tomato-basil. Yuck! I love GIANDUGIA (or GIANDUJA? I never get how it is spelled). I tried it all over Italy, at giolitti, the Grombucks of this world, in Florence at Vivoli but nothing ever got close to the smoothness and taste of a real Italian gelato and cafe place in Paris (yes in Paris) where we spent the first days of our wedding tour in Europe. As a Gelatoholic I googled Pozzetto.biz up in several reviews and it really stands for what people say. Spread the word around but not too much as they may run out of their only 12 freshly made flavours. 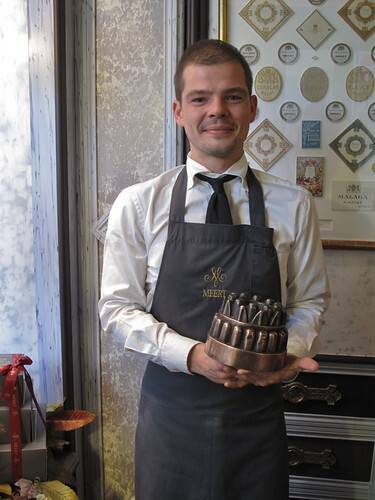 Their cute Italian waiters (and waitresses my husband says) claim Gelato as any food is at its best when prepared daily. For me the best gelato you find in Venice on the Rialto Bridge. New opening gelato shop GO.NA on may 2010. Very Cool. Homemade ice cream with fresh fruit.